February 20, 2011 - St. Vincent and the Grenadines (SVG), a collection of 32 islands and cays in the Southern Caribbean, plans to commence operations of its new Argyle International Airport in early 2013, clearing the path for direct international jet service and expanding its passenger-handling capacity fivefold, said Glen Beache, Chief Executive Officer of the St. Vincent and the Grenadines Tourism Authority. Mr. Beache shared the news at the 4th Routes Americas event that opened Monday in the Dominican Republic, which he was attending to meet with airlines and other development partners. It is the first time the Routes Americas conference has been held in the Caribbean. 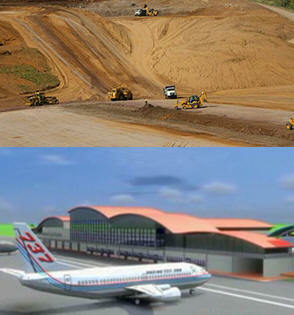 The progress of the Argyle International Airport, which is expected to attract direct flights from key North American and European gateways, “has sparked the interest of major carriers from the U.S., Canada and Europe along with leading hotel and resort companies who are taking a closer look at investment opportunities in St. Vincent and the Grenadines,” Beache noted. The new Argyle International Airport will replace the existing E.T. Joshua Airport when it is slated to open in early 2013. As the largest development project ever undertaken in St. Vincent and the Grenadines, it is a critical cog in the evolution of the multifaceted, multi-island destination’s growing hospitality sector. Runway and other construction have been moving ahead with 65 percent of the project’s earthworks components completed by the end of 2010. The new terminal building, which will break ground soon, will have three floors with 129,870 square feet of floor space – designed to handle about 1.4 million passengers per year, more than five times the number of passengers currently passing through the existing airport. “The Argyle International Airport Terminal has been carefully sized to accommodate our expected growth in passenger traffic over both the medium and long terms. Tourism is and is likely to remain our main foreign exchange earner and this investment in major infrastructure development will allow us to attract direct flights from major U.S., Canadian and European cities,” Beache said. The Argyle International Airport will sit on roughly 175 acres of land, with a paved runway 9,000 feet long and 150 feet wide. The airport is designed to accommodate jets as large as Boeing 747-400s. The project broke ground on August 13, 2008, and is expected to be complete by the end of 2012. The airport is being developed by the International Airport Development Company (IADC), a private limited liability company wholly owned by the government of St. Vincent and the Grenadines. A collection of 32 unspoiled islands and cays in the secluded Southern Caribbean, St. Vincent and the Grenadines boasts the best of what the authentic Caribbean is renowned for. The Grenadines stretch for 45 miles south from the main island of St. Vincent and include eight inhabited islands: Young Island, Bequia, Union, Mayreau, Mustique, Canouan, Palm Island and Petit St. Vincent. Tobago Cays is a horseshoe-shaped reef that shields five deserted islets and is renowned as a sailing and snorkeling mecca.